We arrived in Tunisia, North Africa in late October 1967. It was like stepping back in time to the biblical stories I had read in school and heard about from people. It was hard to comprehend that this was for real. On the way to the ship we passed men dressed in long kaftan's and one man was guiding a donkey that was so over burdened with produce, I was amazed the poor donkey could walk.There were very few women around and those that were tended to be dressed in dark clothing that covered them from head to foot, eyes peeping out from behind their veils. The sun was hot and relentless, I had never felt heat like this before.Before I knew it we were at the dock and there before us was the "Royal Scotsman". I had never been on a ship before, so this was a lot of firsts, the flight over, North Africa and a ship. At the time it seemed really exciting and I wasn't sure what to make of it all. On arrival on the Royal Scotsman, we (my Dad and myself) were ushered off to an office and I was given a form to sign. This form was a contract to say that I would become a Sea Org member and had to sign up for the duration of a billion years.This meant nothing to me, I could not imagine another 10 years, let alone one billion. My Dad questioned the officer and said "she's only 10 years old, are you sure this is necessary?" The officer said " If she doesn't sign the contract, you'll have to get off the ship." My Dad looked quite concerned, we were left alone for a few minutes to talk it over. I knew my Dad could not afford to get us back to England and if it wasn't for me insisting I wanted to be with him, he would not have been in this predicament. I insisted I signed the contract, unfortunately I had no idea what this would mean and how this would affect our future, sadly neither did my Dad. That same afternoon we went off the ship to have a look around at the port we were in. It was odd to me that this dusty town, with dirt tracked roads and funny quaint little shops stocked coca cola in bottles and Daz washing powder, just like at home. Yet it was so unlike anything I had ever seen before, a totally different world. At a little mobile stall not far from the dock we met up with some other people from the ship and sipped home made lemonade, that was bright yellow.While my Dad and friends were chatting all these skinny little children appeared, dressed in rags and begging for money. I couldn't understand why no one gave them any, they looked like they needed it. I then got a lecture on why you should not give these children money. I was told that if you gave one or two of them money, you would then find yourself surrounded by even more begging children. A few days after arrival on the "Scotsman", I found myself on the dock with some of my new made friends, we had met before at St. Hill in England and I shared a cabin on the ship with one of these friends. On the docks there were always lots of traders selling their wares, and on this occasion there were these tiny little cameras for sale. All of us kids wanted one and several of these tiny little rolls of film. We spent the next few hours taking pictures of all the new arrivals aboard the "Scotsman", lots of new people were arriving on a daily basis, and this was becoming a major operation in the Scientology world. Initially there was nothing much for me to do and some of us kids would amuse ourselves by watching the traders on the dock below.They would use no end of verbal persuasion to entice the crew down onto the dock to buy their wares. There were always several of them and if approached by one person, the poor person was mobbed to buy their stuff. It was very entertaining. If no one left the ship, they would spend the whole day calling up to who ever they saw on the ship in the hope that they would come doawn and buy something. Meanwhile there was lots of activity on board also, supplies arriving, yet more people came to join the crew. Right from the start I didn't see a lot of my Dad, but it was enough to know he was around, we met up at meal times in the first few weeks and there was a day of liberty now and then so it was all good or so I thought at the time. After a little while I was bored, my friend and cabin mate was often working. She ran messages around the ship and I wanted to too. There was a class room and some schooling aboard ship, as far as I remember we had to attend 2/3 times a week. the first time I went I was late as I didn't realise I had to be there. I was sat down with a dictionary, a list of words and had to look up all the words on the list. It was a case of get on with it. We also had plastercine and had to make a picture of what the word represented.It was like no schooling I had had before, and apart from not getting it, feeling totally out of my league, I soon realised I did not like this new school.In all I only attended school about three times in my approximately 21 months on the Apollo. As luck would have it, L. Ron Hubbard came to me one day on his daily walk abouts on deck and said he had heard I wanted to be a "messenger", L . Ron Hubbard was the founder and leader of Scientology and according to my Dad the most important man in the world, as a little kid it was considered a great honor to be chosen as one of his messengers. He said he thought I was a little young but we would give it a try and see how it worked out. I thanked him and he thought that was very funny for some reason, which had me a little confused. In fact he thought it was so funny he repeated "Thank you" three times, laughing all the while. I was now going to be a Commadores Messenger working directly for this most famous of men. School was over, but I was about to embark on a very different type of education in Scientology's world of "Knowing how to Know". "A One Billion Year Contract"
I was a little kid aged about 6 years old when my parents got involved with Scientology in East. Grinstead. St hill Manor was the home and mecca of Scientology in England and remains so today. Back then L. Ron Hubbard was at the helm, and later in 1967 he was literally at the helm as he roamed the seas of the mediteranean with his Sea Organization. As a young child of 10 years I signed a billion year contract to be part of L. Ron Hubbards' Sea organization, it was the only way I could stay with my Dad. 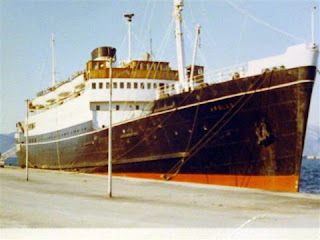 Initially it was thought to be an exciting adventure, sadly for many it turned into the nightmare from hell...................this is the story of life on board the Apollo, or the Royal Scotsman as it was originally called, from a childs eye view.